I have slashed prices on crystals balls. I have 3 sizes available 80mm, 110mm, 130mm. Supplies are limited. My crystal ball are made from 100% quartz crystal that has been crushed, melted, molded and polished into an almost flawless sphere. They are not lead crystal as you will find more commonly. These crystal balls are mesmerizing to look into. A great gift idea for the spiritual someone who seems to have everything. 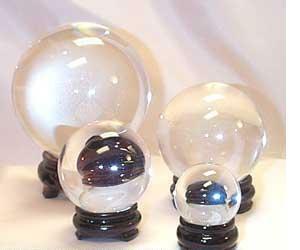 Real quartz crystal balls – Prices slashed!